Have a more secure financial future in an uncertain world by creating a stream of reliable passive income with high yields. Tea with AK: Small talk. Contact AK: Ads and more. The email address in "Contact AK: Ads and more" above will vanish from November 2018. FAKE ASSI AK71 IN HWZ. Past blog posts now load week by week. The old style created a problem for some as the system would load 50 blog posts each time. Hope the new style is better. Search archives in box below. How to follow comments in ASSI? Click here. Get alerted to the latest articles by email? Easy. Click here. Ideas on investing in SG. FY2017 passive income from non-REITs (Part 2). If you have not read Part 1, read it: HERE. To continue, as things turned out, I grew my relatively small initial investment in ComfortDelgro rather significantly. For weeks following the time I first invested in the business, ComfortDelgro's share price did a rather placid see-saw movement. Whenever the share price retreated to around $2.00 per share, I nibbled, as I decided after doing more research that $2.00 was a fairly good price and I believe it still is. Then, informed by the technical analysis which I did a few months ago, I increased my investment again when its stock declined closer to $1.90 a share prior to the proposed deal with Uber to purchase a 51% stake in LCR. There was a rebound in its share price after the announcement but in the following sessions, it drifted lower to test support found at $1.90 a share. No, I pounced on the opportunity to add again to my investment. 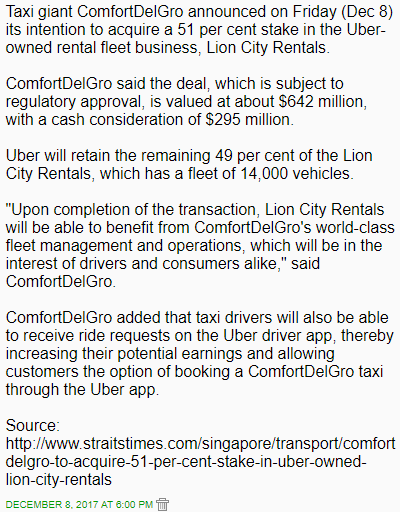 ComfortDelgro's 51% stake in LCR. In a downtrend, supports are more likely to break but, together with the fundamental analysis I did, they gave me an idea of where I might want to add to my investment. Could the stock decline even more in price? I don't know if it would but it could. In the face of massive disruption by Grab, I decided that ComfortDelgro could continue with a 10c DPS comfortably (pun intended) even without its Singapore taxi business. In my first blog on ComfortDelgro, if you remember, I assumed what I felt was a very realistic 7c DPS and, so, anything higher than that is a bonus to me. As long as this remains true, all else remaining equal, I would very likely add to my investment on any future price weakness which coincides with the supports which I have identified. From an investing for income angle, I am comfortable with ComfortDelgro. With rather strong cash flow, the investment risk is very low although its share price could continue to experience volatility. For income investors, it should be about getting in at a price which makes sense to us and price volatility really should not bother us unless we are investing by using money which we really shouldn't be using. It is worth being reminded that ComfortDelgro is not just about taxis in Singapore. Having said this, the fear that ComfortDelgro could see its stock sinking in price is not unreasonable, of course. Someone asked if ComfortDelgro's share price has bottomed? I would be very wary of anyone who tells me he knows the answer, either way. Although I did a bit of technical analysis on ComfortDelgro, I do not know if the stock price has bottomed but it looks like it has at least found a floor and the momentum oscillators are supportive of this. Now, fear can be a good thing because it stops us from acting recklessly but irrational fear might hold us back from making sensible decisions. I always tell myself that to fear is human but it is never a good excuse for inaction. I also remind myself that I probably would not be able to buy at the lowest possible price. If I did, I was lucky. In summary, as an investor and not a trader, I decided that since a sustainable and meaningful dividend from a company like ComfortDelgro was attractive for me, the rational thing for me to do was to make it a bigger investment in my portfolio. So, I did exactly that and it helps to reduce my investment portfolio's at one time heavy reliance on S-REITs for passive income. At lower prices, all else being equal, dividend yield would expand and make investing in ComfortDelgro for income even more compelling. Now, you know why I am ready to buy much more if there should be more blood letting in the market. Roll out the war chests? See related posts at the end of this blog on why I decided to invest in ComfortDelgro as its share price plunged. Some might remember why I added substantially to my investment in SingTel earlier in the year. I will talk about this in Part 3: HERE. I think of CDG as an equity bond. So, it isn't about growing DPS. I would be unlocking my CPF money if CDG offered a 7% dividend yield, all else being equal. 4Q 2018 and FY 2018 passive income. Financially free and Facebook free! Income tax payable in 2019? Sold First REIT to raise funds. Special dividend from VICOM and financial freedom. Voluntary contribution to CPF MA in 2019. This week's Top Blog Posts. Leaving a legacy as ASSI turns 9 and AK stops blogging. Reads for undergrads and fresh grads. AK answers 10 questions from undergrad. Graduating soon? Think financial security. Term life insurance: Why and how? Term life insurance for a fresh grad? Early critical illness insurance for me? My blogs on insurance matters. New here? Read 9 wealth building posts. Getting the most out of ASSI. Beginner's guide to investing in stocks. Recommended books for FA and TA. How to be "One Up on Wall Street"? Beating the Street with value deals! 3 points in stock investing. 5 rules for successful stock investing. Is that stock a bargain or a value trap? Little Book of Value Investing. Little Book That Beats The Market. When to BUY, HOLD or SELL? Warren Buffet, the greatest money maker. Rich Dad, Poor Dad: 2 are better than 1. Wealth Creation: Earn and save. Free ourselves from wage slavery now. Average income? You can be rich! Secret formula to getting rich. $600 richer each month without any risk. How big should be our emergency fund? How to have a comfortable retirement? An easy way to improve cash flow in life. 2 questions that build wealth. Is AK a rags to riches story? Ways to reduce income tax. 7 money habits of AK71's. Not enough money to be married. Wage slaves should be fearful. If we are not rich, don't act rich! Don't see money, won't spend money. A common piece of advice on saving. Wealthy nation cannot afford to retire? Very first step to becoming richer. Do you want to be richer? Save 100% of your take home pay! Become richer. Need or want? Difference between lending and donating. A special chest for emergency funds. Wealth Creation: CPF and SRS. $1.5 million in CPF savings. Unhappy with CPF. Angry with AK. Top Up CPF-SA, CPF-MA or SRS? 4 ways to boost our CPF savings. How to grow our CPF savings? Top up your wife's CPF. CPF-SA is not a free lunch. CPF-SA savings 10 years from now. Which CPF Life Plan for me? BRS, FRS, ERS CPF LIFE payouts. How to do online contribution to CPF? How I use my SRS money and why? Showing off my CPF numbers (2017). How many 20 yrs and $29K do we have? How younger members get 6% per year? My CPF-SA outperformed in 2015. Mom is stunned by her CPF-RA money! AK is showing off his OA and MA. 2016 changes to the CPF and SRS. Use CPF or cash to buy a home? Proposed changes to the CPF system. Stopping accrued interest from growing? Retirement: Buy a AAA rated bond. How did he amass so much in his OA? Upsize $100K to $225K in 20 years. Double your income, not your income tax. Build a bigger retirement fund: CPF-SA. A war chest called "SRS". Make money, do good and pay less tax. Wealth Creation: Investing in real estate. Buying properties with short land leases? Have a fully paid HDB flat? Fixed rates, SIBOR, FHR18 or HDB? HDB flat is 37 years old but son is 8. HDB HIP and VERS explained. Why my shoebox apartment makes sense? Ask two questions before buying. Affordability and value for money. CCR, RCR or OCR for rental income? To rent or to buy: Rule of 15. Invest in Japanese real estate. Slaving to stay in a condominium........ Sanity check in the comments section. Affordability of housing in Singapore. More cooling measures on the way? Leverage up. Buy investment properties. Never lose money in real estate? Selling a private property just got harder. Making your first million dollars in real estate investment: Dreams and nightmares. 3Q 2018 income from non-REITs. 3Q 2018 income from S-REITs. 1H 2018 passive income was $96k. 2Q 2018 income from non-REITs. 2Q 2018 income from S-REITs. 2017 FY income from non-REITs. 2017 FY income from S-REITs. 2Q 2017 income from non-REITs. 2Q 2017 income from S-REITs. 2016 FY income from non-REITs (Part 2). 2016 FY income from non-REITs (Part 1). 2016 full year income from S-REITs. Make $1M investing for income? 1H 2016 income from non-REITs. 1H 2016 income from S-REITs. 1Q 2016 income from non-REITs. 1Q 2016 income from S-REITs. 2015 full year income from S-REITs. 2015 full year income from non-REITs. Invest for income and ignore the two Ms. The secret to AK's success as an investor. How AK created a 6 digits passive income? $50K passive income investing in stocks? Work because you want to. To retire by age 45, start with a plan. 7 steps to passive income from stocks. More passive income with limited capital. Mystical art of wealth accumulation. 5 points you ignore at your own risk. The instant gratification of yield. Financial freedom is a family affair. $120K annual passive income from REITs? 2011 full year income from S-REITs. 2012 full year income from S-REITs. 2013 full year income from S-REITs. 2014 full year income from S-REITs. 2014 full year income from non-REITs. The best insurance in life. Free ILPs or Term Life Policies? Millionaire or not, plan for retirement. Enhanced Incomeshield for my mom. Free medical insurance in Singapore? Free medical insurance in our old age. My investment portfolio or philosophy? Investing pyschology and our fears. A holistic approach to wealth creation. Avoiding instant gratification of yield. Why have bonds in our portfolio? Emergency fund, war chest, fixed deposits, OCBC 360, UOB ONE & CIMB savings a/c. What to do as the stock market crashed? Bad to get regular dividends & sit on cash? 6 point response to "expensive lesson". How to have peace of mind as an investor? Do your parents have H&S coverage? How much to invest? Nibbles and gobbles. Get paid more waiting for opportunities. UOB ONE Account or OCBC 360? Revisiting my strategy with Mr. Munger. A way to double digit yielding portfolio. Motivations and methods in investing. Managing exposure in investment portfolio. Be fully invested in the stock market? Making recovery from losses easier. Don't think and grow rich. If we want peace, be prepared for war! Excuse me, are you an investor? To be a happy peasant. Be comfortable with being invested. Do not love unless it is worth the loving. Have money must have a heart. When is it OK to be nice and unhappy? Wealth Creation: $1 million trilogy + 4. Retiring a millionaire is not a dream! What is S$1 million at retirement? Achieving S$1 million in retirement funds. An average HDB household and $1M. Suddenly, financial freedom is less remote. Don't thank AK but thank yourself in future. Retirement adequacy for late bloomers. Fraud: Advice from a fraudster. Fraud: Like taking candy from a baby. Know what is good for us. Thought process of scam victims. Have a plan, your own plan. Rules for investing in difficult times. Lee Kuan Yew on Eurozone crisis. Do you need or want financial assistance? The ideas expressed in this blog should not be construed as an enticement to buy or sell the securities, commodities or assets mentioned. The accuracy or completeness of the information provided cannot be guaranteed. Readers should carry out independent verification of information provided. No warranty whatsoever is given and no liability whatsoever is accepted for any loss howsoever arising whether directly or indirectly as a result of actions taken based on ideas and information found in this blog.